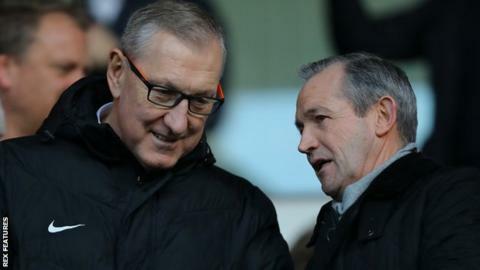 Former Ipswich Town defender Terry Butcher says owner Marcus Evans must "release the purse strings" if the Championship club are to progress. The Tractor Boys added five players in January but only paid fees for Irish pair Aaron Drinan and Barry Cotter. Ex-England captain Butcher, 59, made more than 250 appearances for the Suffolk side between 1976 and 1986. "If you've only got buttons to pay, you're not going to get the quality to lift you into the play-offs," he said. "Marcus Evans, sooner or later, will have to release the purse strings. Perhaps not to the extent of Wolves, but if you do buy good players and buy quality it does get you wins, it does get you goals and it does get you up the table." Evans became Ipswich owner in December 2007 and is said to have invested £100m into the club. They are 12th in the second tier, eight points from the final play-off spot, with manager Mick McCarthy out of contract at the end of the season. "I think there's got to be more input from the chairman," Butcher told BBC Radio Suffolk. "The manager should already be looking at signings for next year - you need that as a security and we haven't got that."